Do you quietly inspect the margins when you arrive at a carp fishing lake? You might want to if you want to improve your catch rate. Fishing for carp in the margins can be extremely productive if you find the right places and apply good angling tactics. I find it amazing just how many carp fishermen ignore the margins when fishing. They see all that water out in front of them and believe the fish must be out there. I often see carp anglers using three rods with all of them cast out to the horizon. With so many anglers casting out far it makes the margins a safe place for carp to hang out. In fact, the margins can even be the best places to target the bigger carp. As long as you’re quiet when setting up and fishing you can take fish from the margins in most lakes. Carp have great hearing and will be able to pick up vibrations from the surrounding bank, thus you do need to be as quiet as possible. Banging in pegs with a hammer will only cause them to move on. During your stay try to remain hidden as much as possible, or keep low when you approach the water. Try to always wear dark green or brown clothing or better still use camouflage clothing. I usually set the bivvy up a little away from the waters edge or try to get hidden behind a tree. I also try to be light on my feet and walk around in my bivvy slippers as much as I can. Hopefully using the tips above will help keep the carp in the margins. Now, what tactics can you employ to catch carp from the margins? Fishing the margins is even more important if the carp anglers at the lake tend to fish at distance. It means the carp are often pressured at range in the waters main body thus the fish become more cautious of bait out there. Eventually the fish have learned that food found in the margins is safer. The trick is to find the more subtle features rather than the obvious ones such as overhanging trees, island banks, etc. Many other anglers would have targeted those obvious features making them a danger spot in the eyes of carp. I feel the best margin features to look for are undercut banks or any protruding point, posts or signs sticking out of the water, small reed bushes, lily pads or inlet pipes. Sometimes the best margins to fish are those away from possible disturbances. Fish the bank furthest away from the road or car park or from the general footpath that the other carp anglers tend to use. Try to find margins where other angler’s wont target. Yes they may not be targeted by others because they are not regular feeding spots for the carp, but they may be areas where the carp feel safe. 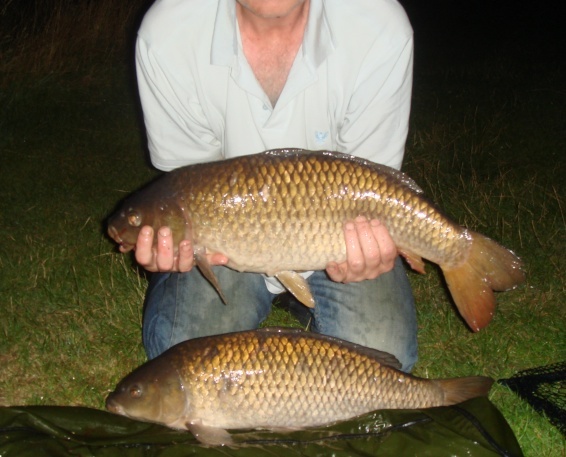 Once bait has been introduced there the carp may start to feed there fairly quickly. If the margins in the lake have some snags or general debris, then it can be a good idea to fish with single hook bait pop-ups. This means you’re not committed to placing the hook baits in the same place every time because you haven’t thrown lots of free bait in an exact spot. You don’t want to have to keep casting to get it exactly in the same spot only to catch a snag and render the rig useless. The greatest advantage of fishing closer in the margins is that you can bait up easily and accurately. You can also place rigs onto the bottom with ease therefore eliminating the chance of any tangles in the main line which can always happen without knowledge during any normal cast. Another benefit to fishing for carp in the margins is that bite indication will be much more sensitive to carp picking up the bait. There is less line distance from the rod to the hook bait which means there will be less stretch in the line. Another tactic is to use running leads as this will create even more sensitivity to bite indication. It will also reduce the chance of a carp unhooking the rig using the weight of a semi-fixed lead. When fishing close in, I use very slack lines with the bobbins resting on the ground so that my line lays flat on the lake bed and out of the way of wary carp. As a final tip, beware of fishing in margins where the wind has coloured up the water. I have read from a good source that small, suspended particles from muddy or gravel lake beds may get stuck in the gills of carp thus they try to avoid these places. If you disagree, then fish in the coloured water, but also try placing a rig just outside the coloured area a bit further from the bank just to see the difference. If it’s actually the carp that have coloured the water then that can be very productive!